Since the publishment of the DiFrancesco-Noble model of cardiac myocyte electrophysiology in 1985 several other dynamic mathematical models of the cardiac action potential have been developed. These models include equations that describe transmembrane ion channels and pumps, as well as the intracellular calcium uptake and release activity of the sarcoplasmic reticulum and changing intracellular ionic concentrations. Dynamic models are carefully constructed to accurately simulate the experimentally observed electrophysiological behaviour of cells. Time-dependent changes (transients) in ionic concentrations and action potentials are often observed in experiments. In mathematical models, transients may represent artifacts of the equations or may reflect physiological processes. In their 2002 paper, James Kneller, Rafael J. Ramirez, Denis Charter, Marc Courtemanche and Stanley Nattel studied electrophysiological transients in an ionic model of the canine atrial action potential. Their aims were to determine whether dynamic models reach stability during sustained pacing, to investigate the ionic basis of action potential transients in the model, and to compare real physiological action potential transients with those generated by the model. Their model was based on the previously published Ramirez-Nattel-Courtemanche (RNC) model of the canine action potential (see Ramirez et al. Canine Atrial Action Potential Model, 2000, also in the CellML model repository). In this model, I Cl,Ca brings Cl- into the cell, but there is no equation to account for Cl- efflux. In their 2002 modified version of the RNC model, James Kneller, Rafael J. Ramirez, Denis Charter, Marc Courtemanche and Stanley Nattel include an inward, electroneutral Na+-Cl- cotransporter (I Na,Ca), and a constant Cl- efflux through a leakage pathway (I b,Cl) (see the figure below). After comparing the results simulated by the model with experimental data, James Kneller, Rafael J. Ramirez, Denis Chartier, Marc Courtemanche and Stanley Nattel conclude that model action potential duration and ionic transients stabilise with appropriate stimulus current assignment. They also found that their model agrees qualitatively with experimental observations, but quantitative discrepancies highlight limitations of model simulations. A schematic representation of the canine atrial myocyte. Intracellular compartments (outlined in dashed lines) indicate the intracellular pools of ion species. The ion concentration in each pool is affected by ionic currents, pumps and exchangers. Black rectangular boxes represent sarcolemmal ion currents, black circles represent the pumps and exchangers. 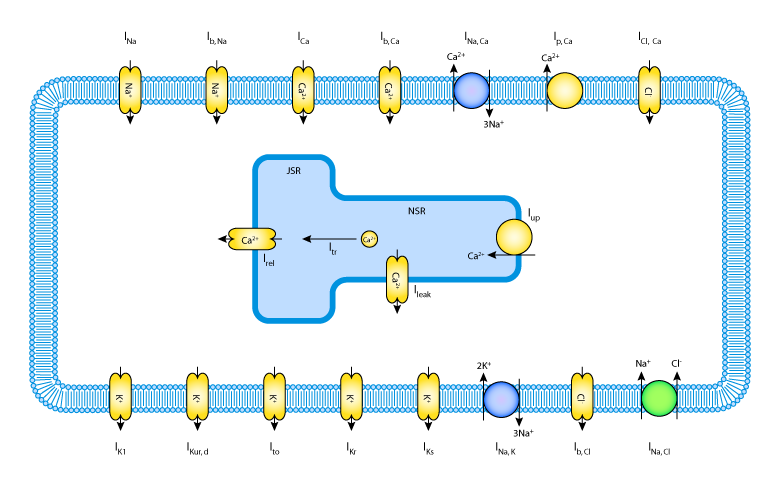 The sarcoplasmic reticulum is divided into two compartments: the Ca2+-release compartment, or junctional sarcoplasmic reticulum (JSR) and the Ca2+-uptake compartment, or network sarcoplasmic reticulum (NSR). Derived from workspace Kneller, Ramirez, Chartier, Courtemanche, Nattel, 2002 at changeset 7815d0f5b1fa.